The Macfarlane Collection is located in Santa Barbara, California along the beautiful central coast. We have been buying fine art for our collection and to sell from around the world for over twenty five years. Our organization is especially interested in 19th and 20th century American art. 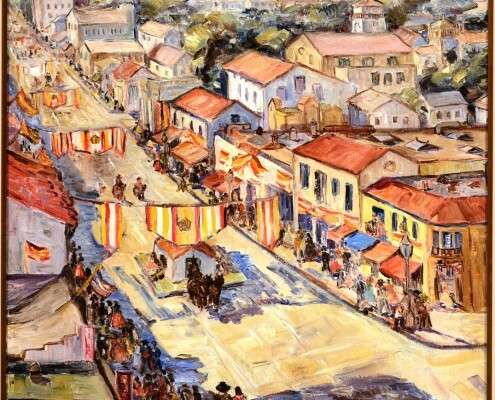 We also have a special interest in California paintings and those which depict scenes of Santa Barbara. Throughout the years of the Macfarlane Collection’s history, our team has become highly respected and qualified to appraise and authenticate every work of art we purchase and offer. The Macfarlane Collection is a member of Sotheby’s Internet Associates and our clients include private collectors, museums, and other well-known art institutions from around the country. Our team operates with the latest computing technology, enabling us to remain up-to-date on changes in the art and auction markets. The Macfarlane Collection values privacy and discretion in our business and in all transactions. We welcome you to contact us regarding fine art you would like to sell. California has long been a land that has inspired the imagination, from the time of the first Native Americans, through the tumultuous years of settlement, to the present day. The story of art in California has many fascinating chapters: the Age of Exploration, the Spanish and Mexican periods, The Gold Rush, the Missions, the Railroad, the ‘Golden Age’ of Landscape Painting, the influence of European art, the evolution of two distinct centers of art in Southern and Northern California, the Great Depression, World War II and postwar to Modernism and beyond. During the 1870s and 1880s many of San Francisco’s artists went to Europe for advanced study at the popular centers of Dusseldorf and Munich. This European exposure changed their style, and those decades were the ‘glory days’ for the production of subjects such as history, still life, and genre, such that were promoted in those German art centers. There are many different styles of 19th and 20th century American painting, including themes such as Abstraction, Historical Subjects, Landscape, Portraiture, Narrative Art and Scenes of Everyday Life. Works of art that re-frame nature for expressive effect are called abstract. Art that derives from, but does not represent, a recognizable subject is called non-representational or non-objective abstraction. History painting records noteworthy events and documents scenes of exemplary conduct, virtue, and patriotism. From the eighteenth and well into the nineteenth century it was considered the most elevated form of art. Landscapes, or views of nature, play a significant role in American art. The earliest American landscape paintings were topographic illustrations of farms, cities, and landmarks that were generally painted for local residents or for Europeans interested in the New World. In the colonial era, landscape views were found primarily in backgrounds of portraits, usually to provide additional information about the sitter. Works of art that tell a story are called “narratives”; their subject matter may be derived from literature, Scripture, mythology, history, or current events. Narratives may be designed to teach, enlighten, or inspire, and often carry moral, social, or patriotic messages. Throughout the history of American art, artists have used narrative imagery to illustrate different facets of the American experience. The term “genre” refers to depictions of scenes from everyday life. Genre painting developed in seventeenth-century Europe, specifically in the Netherlands, when newly gained prosperity generated a large middle-class and led to broad-based patronage of art and artists. Genre emerged in America about two centuries later, when the ambitions and optimism of this young country gave rise to a public eager for pictures of people at work and play.